Ladies’ 1 had two tough matches at the start of the month in Division 3 starting with the visit of Bracknell 2. Both of the Crows’ pairs found Rebecca Howard & Maggie Chantry too tough on the day, Cath Sillitoe & Emma Knowles losing 4-6 4-6 in the first round and Jenny Sheppard & Ravinder Norman losing 3-6 0-6 in the second. However, Noreen Bedford & Laura Lloyd-Jenkin were an easier proposition, Sheppard & Norman battling their way to a 6-4 7-6 win before Sillitoe & Knowles rounded off the match winning 6-2 6-1, only to find they had lost the match by one game, 36 to 37. The same day Ladies’ 2 had a tricky visit to Caversham Park to play their 2nds in Division 7. It was a strong home team performance and, in the first round, Alison Nicholson & Jenny Partridge lost 1-6 1-6 to Celine Loader & Esther Rodriguez while Maddy Dunckley & Pauline Snell were losing 1-6 4-6 to Caroline Hailstone & Jade Turner. Nicholson & Partridge did salvage a rubber in the second round, winning 6-4 5-7 1-0 after a long battle but Dunckley & Snell lost 1-6 3-6 to Loader & Rodriguez to make it 3-1 to the home side. A 4-0 win in their final match, against bottom team Bracknell 4, would see them safe from relegation, swapping places with Caversham Park. The following week Ladies’ 1 entertained Twyford 1 in a match rearranged from the start of the season. The visitors arrived with a strong team including Margaret Croft who is at least 70 and as difficult as ever to play against. Fielding the same team as the previous match, Knowles & Sillitoe had a battle against Karen Bailey & Rebecca Jenkins, winning 6-3 3-6 1-0, but Sheppard & Norman could make little impact on Karen Mckenzie & Margaret Croft, losing 1-6 1-6. It was a similar story in round two with Knowles & Sillitoe winning a tough match 7-5 6-3 against Mckenzie & Croft while Sheppard & Norman were losing their second round rubber 1-6 4-6. So a loss by a set and by a significant games margin, 30-41. The two hard won points from the two matches do, however, virtually ensure the team’s survival in Division 3 with a match against bottom of the table BCS 1 still to play. The last weekend of Mixed matches saw a clear win, a winning draw and a resounding loss. 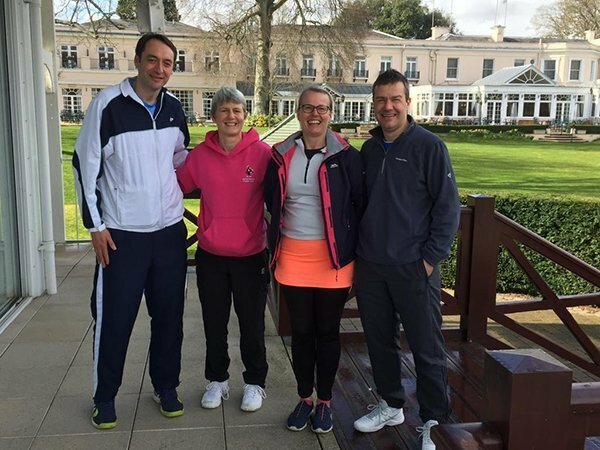 Mixed 1 entertained Bisham Abbey 1 in Division 3 and Matt Paxton & Tina Stern had a good start with a 6-3 6-1 win against Norman Bhargava & Helene Vanschaik. Hamish McCarthy was playing at this level for the first time and he and Emma Knowles struggled in the first round, losing 3-6 3-6 against David Saint & Esther Mckenna. Paxton & Stern also found it tough against Saint & Mckenna but they won what turned out to be the viatl set despite losing 2-6 6-3 0-1. McCarthy & Knowles, much improved after the first round, won their second rubber 7-5 6-3 against Bhargava & Vanschaik to make it a 5-4 win on sets for the Crows. Mixed 2 finished their winter with a relatively straightforward 4-0 win against Bisham Abbey 2 away on clay courts. Alison Nicholson & Mark Callaghan beat Mark Neal & Meldy Tristano 6-0 6-4 while Jenny Sheppard & Simon Usher were winning 6-2 7-5 against Heidi Daniell & Ben Gale. Nicholson & Callaghan then won 6-4 6-1 against Daniell & Gale and Sheppard & Usher had another straight sets victory, 6-2 6-0 against Neal & Tristano. The win puts the team into 3rd place in Division 4 safe from either promotion or relegation. Mixed 3 had a trip to Phyllis Court and found themselves up against a clearly much stronger team and lost 0-4! However, Andrews Morrison & Lewis with their partners Jenny Partridge & Wendy Miles enjoyed a pleasant morning and especially the club’s renowned hospitality with a cream tea and cucumber sandwiches the highlight of the morning. The team finishes 5th in Division 5E, clear of relegation. On the penultimate Saturday of the season, Ladies’ 2 hosted Bracknell 4 in their final match in Division 7. Alison Nicholson & Pauline Snell were in great form, seeing off Lisa Vassallo & Marie Scarrott 6-3 6-1 in the first round before beating Rachel Kompfner & Beverley Arnell 6-2 6-0 in the second. Kompfner & Arnell were too strong for Crows’ second pair, Maddy Dunckley & Sarah Mayhew, however, winning 6-2 6-4, but Dunckley & Mayhew made sure of at least 2 points by taking the first set 7-5 against Vassallo & Scarrott before losing the second 3-6 and the tie-break. The 2 points leaves the Crows in 6th place, just in the relegation zone so they may be in Division 8 next year. The following day our 18U Boys faced Latika 2 away and lost 0-3. Dan Rippon had a good fight against Joseph Jeffery, losing 6-2 4-6 0-1, but Owen Lawrence was beaten 6-0 6-0 by a strong Bruce Rooke. Unfortunately, Rippon was injured during his singles so the doubles was conceded. On the same day our 14U Boys travelled to Caversham Park and were beaten 3-0 by a team that was found to have included an ineligible player. The rule is to ensure that matches are reasonably competitive at this level so Christian Rowbotham rated 8.1 should not have been playing in this division. He gave George Loverdos no chance, winning 6-0 6-0, but the home second player was also pretty good, winning 6-1 6-2 against Arlo Filley, before the home pair won 6-0 6-0 in the doubles. In the final match of the season was Ladies’ 1 away to BCS 1 in Division 3 and the Crows came away with 3 points having won 3-1. Emma Knowles & Tina Stern beat Denise Taylor & Susan Wells 6-3 6-3 while Cath Sillitoe & Alison Nicholson were battling to a deciding tie-break against Sarah Quant & Jane Hunt, winning 6-2 2-6 1-0. Clearly Sillitoe & Nicholson had given everything in the first round as they succumbed 1-6 1-6 to Taylor & Wells in the second, but Knowles & Stern clinched the 3 points with a straightforward 6-2 6-0 win against Quant & Hunt. The team finishes in 4th place, just 2 points from promotion in a closely fought Division 3.